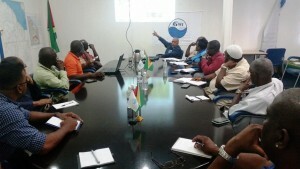 GWI Chief Executive speaking to stakeholders about the level of the East Demerara Water Conservancy. Even as hospitals and restaurants are being urged to store water to help cope with the drought, authorities are considering diverting creeks to the East Demerara Water Conservancy (EDWC) if a flyover shows that water is available, according to the Director General of Guyana’s Civil Defence Commission, Retired Colonel Chabilall Ramsarup. “I did recommend that we should look at north of the conservancy and see if water is available because I did talk about the creeks that are flowing the black water- the fresh water- into the Demerara River and see whether we can have those creeks diverted to bring the water into the East Demerara Water Conservancy,” he said. Ramsarup hopes that the planned reconnaissance flight early next week by representatives of the Guyana Rice Development Board, Guyana Sugar Corporation and the National Drainage and Irrigation Authority will prove that there is sufficient water in the swamps and creeks to be diverted to the EDWC. With 60 percent of the water being distributed to the residents, businesses and hospitals in Georgetown coming from the EDWC, Ramsarup said it would be important to raise the level of the reservoir. 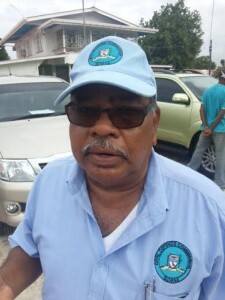 Director General of Guyana’s Civil Defence Commission, Retired Colonel Chabillall Ramsarup. Ramsarup informed that it is vitally necessary that the EDWC be replenished from sources other than the Mahaica and Mahaicony to avoid salt water intrusion that would result in short and long-term impacts on farming. “The faster we pump the water from those rivers, further the salinity goes into those rivers and shortly if we keep pumping we may not be able to pump any longer because what we will be pumping is salt water,” he said. Authorities are also pumping water from the Pomeroon, Canje and Berbice Rivers for agricultural use. Across in Region Nine, Ramsarup said if the drought persists authorities would have to consider transporting supplies of bottled water to the Rupununi. Currently, he said Region Nine has acquired more than 35 black tanks, 15 two-inch water pumps and a large quantity of water purification tablets. “So what they are doing is that they are going where the water is available , we load them (tanks) on the tractor-trailer, pump the water in, take it to the villages and then pump the water out to a reservoir the village would have had,” he said. The Head of the CDC has already told government that if the rains do not come by the end of March, food and water would have to be transported to Region Nine. Authorities say the rice and sugar crops will be badly affected by the El Nino-induced drought which had showed signs since late last year. There will be sufficient supplies of those commodities for domestic consumption. Top officials of GWI Thursday told representatives of the five public and private hospitals and the Guyana Fire Service about the latest water conservation measures. The GWI Chief Executive Officer said hotels, hospitals, restaurants and other service oriented entities must commence preparations to store water.